LONDON The Afghan government has levied at least $93 million in taxes on U.S. contractors that should have been exempt under agreements reached between the two governments, according to a new report from a congressionally mandated special inspector general's office. In total, since the office of the Special Inspector General for Afghanistan Reconstruction (SIGAR) began auditing the tax payments of 43 different contractors working for U.S. government agencies in 2008, those contractors have paid $921 million to the Afghan Ministry of Finance (MOF), according to the report. While SIGAR said $93 million of that was assessed in violation of the U.S.-Afghan tax agreements, it adds that, "based on our audit work, we believe that much of the remaining taxes are also illegitimate." The audit "identified instances in which the MOF assessed tax liabilities on contractors even though the contractors held MOF-issued tax exemption certificates," according to the 37-page report (PDF) published Tuesday. While SIGAR's report is highly critical of the MOF for allegedly levying the improper taxes, it also sharply accuses at least two U.S. government agencies of reimbursing contractors - at U.S. taxpayer expense - for tax charges they should never have paid in the first place. The report alleges that contracting officers at both the Department of Defense (DOD) and the State Department's Bureau of International Narcotics and Law Enforcement Affairs (INL) "do not fully understand Afghanistan's tax laws and, as a result, they have improperly reimbursed contractors for taxes paid to the Afghan government." CBS News has been unable to contact officials with the Afghan Ministry of Finance to comment on the allegations, but the SIGAR report itself makes it clear that a disagreement over precisely which U.S. contractors should be subject to Afghan taxes is at the heart of the matter. "MOF officials assert that the DOD and State INL agreements provide tax-exempt status only to prime contractors, and not subcontractors, whereas U.S. government officials contend that the agreements provide tax exemption for all non-Afghan companies (both prime and subcontractors) supporting U.S. government efforts," explains the report. Contacted by CBS News on Tuesday, Ministry of Finance media spokesman Najib Manali confirmed that, in the ministry's view, the tax agreements do not provide exemption to subcontractors - only companies "dealing directly with U.S. and NATO forces." The MOF told CBS News Kabul bureau chief Mukhtar Ahmad that the agreement was signed by the Ministry of Foreign Affairs. The Afghan government would not provide CBS News with a copy of the document. Contractors have been a huge part of the U.S. war effort in Afghanistan as they were previously in Iraq. CBS News correspondent David Martin reported in the summer of 2011 that as many as 260,000 contractors were on the U.S. government payroll at any one time, and amid the chaos of war, it has all been too much for Washington to manage. A separate independent commission reported in 2011 that the U.S. government was "wasting between $30 and $60 billion during the course of our engagements in Iraq and Afghanistan" due to corruption and poor contractor accountability. SIGAR detailed in its report suggestions made by the office of Special Inspector General John Sopko to the heads of six U.S. agencies, including Secretary of State John Kerry and Secretary of Defense Chuck Hagel. According to the audit report, the office responsible for managing contractors for U.S. Central Command (CENTCOM) and the U.S. Army Corps of Engineers both "concurred with SIGAR's recommendations." 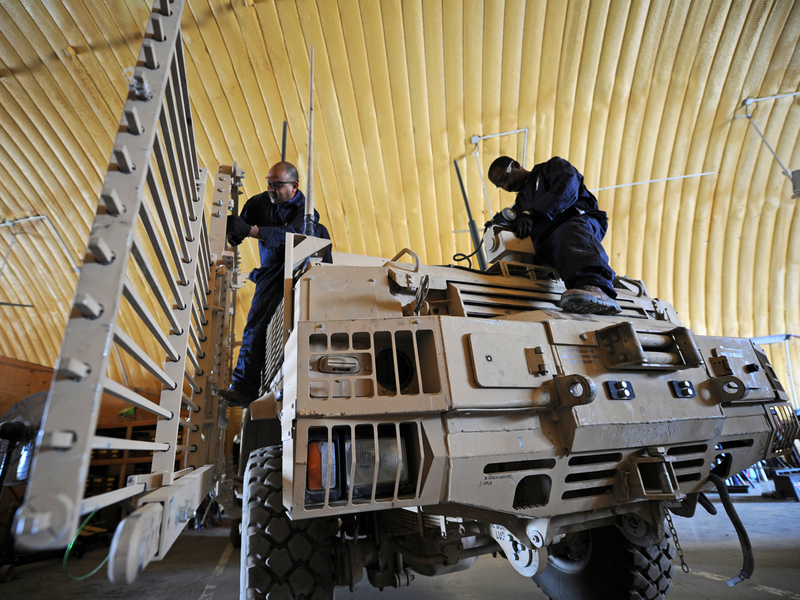 Responding to the recommendations, CENTCOM's Joint Theater Support Contracting Command, based in Afghanistan, said April 17 that it had taken "aggressive action to develop procedures and conduct training to address the deficiencies noted by SIGAR." The Army Corps of Engineers replied to each of three relevant recommendations from SIGAR by outlining plans to alter training of its contracting officers to help them "gain a better understanding of their responsibilities to assist contractors in the tax exemption process." One of the broadest recommendations from the SIGAR audit, however, was issued to the State Department, urging the agency to, "develop a consistent, unified position on what the U.S. government deems appropriate taxation of contractors supporting U.S. government efforts in Afghanistan." That suggestion was dismissed by the State Department when offered up in a draft of SIGAR's report. According to the final report, State "argued that such a unified position already exists and that it is inappropriate to suggest that there are inter-agency differences" over how contractors are led to deal with Afghan taxation. The State Department's international aid agency, USAID, also deflected SIGAR's criticism, telling the special inspector general's office, "the recommendations made had already been implemented, were not applicable, or lacked detailed analysis for the agency to implement," according to the report. A letter written to Special Inspector General Sopko from USAID, dated April 26, accuses SIGAR's report of "failing to differentiate successful implementation from problems and thereby confusing readers into thinking that legitimate tax assessments were levied and paid in error." Fingerpointing between the Afghan and U.S. governments and between the special inspector general's office and the agencies it was tasked with overseeing aside, the audit - and the fingerpointing itself - is further evidence that inefficiencies born of a war managed by armies of outsourced labor continue to cost U.S. taxpayers dearly.